The 3MV-1 No. 4 spacecraft equipped with a lander designed to land on Venus lifted off from Site 1 in Tyuratam on April 2, 1964, at 05:42:40 Moscow Time. This time, the 8K78 (Molniya) rocket performed flawlessly, with its third stage (Block I) inserting the payload into the initial parking orbit around the Earth and separating. Block L fourth stage then fired successfully, propelling the spacecraft into an orbit around the Sun with a period of 290 days and heading to Venus. (227) The probe then successfully separated from Block L, however a leak was detected in the pressurized compartment of the spacecraft. In just a week, the pressure inside dropped to just 1 millimeter of the mercury table. Immediately, it was clear that with such a major problem, the spacecraft would not be able to fulfill its mission, because sensitive electronics inside the orbital module, such as radio-transmitters, were not designed to function in vacuum. Therefore, it was not politically acceptable to announce the mission as Venera-2. At the same time, the spacecraft had left the Earth orbit and was heading into deep space, which would not fit very well into the profile of faceless Kosmos missions. As a result, it was decided to announce this launch as Zond-1. After all, it had become an endurance test vehicle, as it had been originally envisioned in the Zond project. Ironically, on April 15, Korolev received a response to his March 23 letter to Sergei Vekshinsky, a top Soviet specialist in vacuum electronics, who agreed to consult OKB-1 on reliable pressurization of spacecraft during long-duration missions. (84) However it was too late for Zond-1. As expected, the probe's main transmitters fell silent. 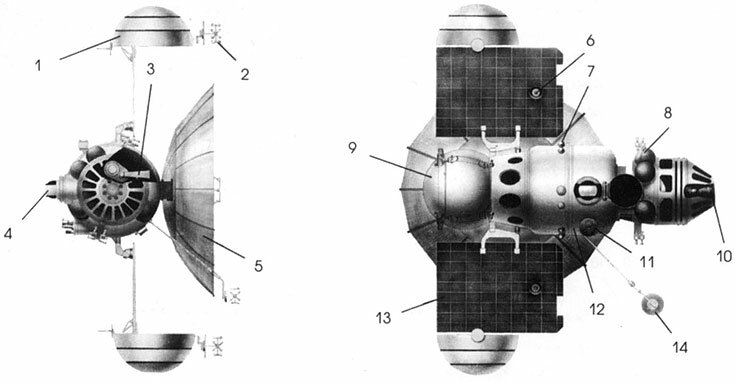 In 1994, a drawing of the 3MV-1 No. 4 (Zond-1) spacecraft was published for the first time, but no photos of this historic vehicle are apparently available.